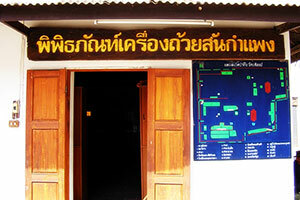 San Kamphaeng Ceramics Museum Set up in 2503 when the excavation of the kiln. Antique wares in San Kamphaeng district. The Fine Arts Department with the Wat Pa Tung. The building exhibits a two-storey building located opposite the City Hall, a huge golden teakwood ossuary LoungPu Lar. Downstairs displays pottery from San Kamphaeng. From the excavation of the Department of Arts and wares are the property of the temple excavated from a clay oven in the same area. The exhibit in a glass case.